Not to be confused with Gloomba. Artwork of a Galoomba from Mario Party 10. 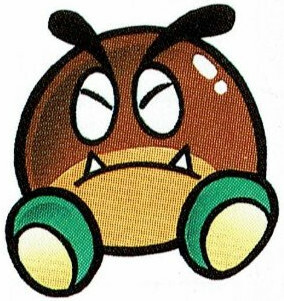 Galoombas (named Goombas before Super Mario 3D World) are somewhat rare enemies from Super Mario World. They either walk across the ground, parachute from above or float down in bubbles (which burst upon coming into contact with any object), or can even appear with wings to hop around. In Super Mario 3D World, they are given the name Galoomba to distinguish them from actual Goombas. Goombas first appear in Super Mario World. Although these creatures walk in straight paths to attack like regular Goombas, these baddies do not resemble the original ones. Goombas do not have mushroom-shaped heads but rather more spherical ones. They also lack a stem; the Goomba's two feet are attached directly to the bottom of the head. As such, they resemble chestnuts more than mushrooms. Goombas cannot be defeated in a single jump, as doing so flips them over and immobilizes them. In this state, they can be picked up and thrown at other enemies, like with Koopa Troopas. Running into them or jumping on them when flipped causes them to be kicked around (though they do not ricochet, like shells do). After a few seconds they right themselves, which damages Mario if he is carrying one. They can automatically be defeated with a Spin Jump, or with a fireball or an attack from Yoshi; an attack with the cape causes them to be flipped over as well. There are two variants of Goombas in the original game. Para-Goombas are Goombas which utilize parachutes instead of being Goombas with wings. Flying Goombas (wing-bearing Goombas) also appear, and can only hop on the ground instead of fly. Like Paragoombas, Flying Goombas' wings are clipped after one stomp, reverting them to normal Goombas, and thus, stomping on them after their wings are gone just renders them helpless for a few moments, allowing the player to throw them at other enemies. Spiked versions of Flying Goombas also known as Para-Goombas later appeared in Mario Clash. In the Game Boy Advance remake, Super Mario World: Super Mario Advance 2, after the player beats the Special Zone and finds all of the exits, the Goombas are recolored yellow and wear sunglasses. In Super Mario Advance 4: Super Mario Bros. 3, a single regular Goomba appears at the end of the World-e level Rich with Ropes, where Para-Goombas can also be found. They can be stomped on and grabbed like in Super Mario World. After a long absence, Galoombas reappear in Super Mario 3D World, alongside regular Goombas and a bigger variation named Big Galoomba. Like normal Goombas in 3D Mario games, they attempt to chase after the player upon seeing them. Additionally, like in Super Mario World, Galoombas cannot be defeated with one jump, as that causes them to be flipped over, though unlike Super Mario World a second jump defeats them. A Ground Pound can also be used to defeat them in one hit. Additionally, Galoombas cannot be carried, kicked around, or thrown, as running into them while immobilized also causes them to be defeated. Galoombas replace regular Goombas when in the Super Mario World style in Super Mario Maker and Super Mario Maker for Nintendo 3DS. They use a slightly edited version of their original sprite from Super Mario World (their feet are colored green instead of yellow to match their artwork and modern appearances), and when stomped on, they turn upside down, waiting for the player to pick their bodies up and hurl them. If a Super Mushroom is dragged onto a Galoomba, the enemy will transform into a Big Galoomba. If wings are given to a Galoomba, it will become a Flying Goomba. Galoombas will reappear in Super Mario Maker 2. Goombas with Boo Buddies and Ninjis in "The Yoshi Shuffle". These Goombas appear twice in the Super Mario World cartoon. They first appear in "The Wheel Thing", in which they are shown as being the "power source" for the cars made by Mario and Luigi. They also briefly appear in "The Yoshi Shuffle" in the audience during the football game. 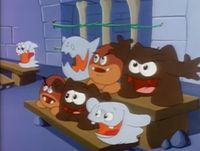 In Super Mario Adventures, these Goombas and at least two Flying Goombas were sent by Bowser to attack Princess Toadstool's Palace. In addition, they were among the attendees to Bowser's marriage to the hypnotized Princess Toadstool. Flying Goombas appear as an obstacle during the minigame Ridiculous Relay. The single player must dodge both them and Banzai Bills in their hand glider, and reach the finish line before the other three players do. Two Goombas appear in Mario Party Advance at Goombob Manor, named Goombob and Goombetty. Red and blue Goombas also appear in Tap-Tap Sumo. Galoombas appear in Mario Party 10, in a few minigames that also feature Goombas and Goombrats. Galoombas appear in the Mario Party: Star Rush minigame Goomba Guess. The goal of the minigame is to tap the most Goombas, while Galoombas deduct one point from the player. In the beginning of the minigame, the placement of the enemies are shown before they shift positions, and afterward are covered by a dark veil so players are required to memorize the placements beforehand. Galoombas appear in Super Mario Party as non-playable characters. A Goomba-like foe that is not a Goomba. "I know they're similar, but for their sake, do try keeping your Galoombas and Goombas straight! Spanish Goombaya Pun on Goomba and baya (berry). German Galumba Transliteration of the English name. Italian Goombruno Pun on "Goomba" and "bruno" (dark brown). 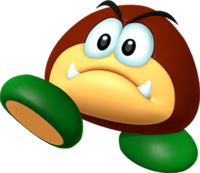 Goombruno is also the name Goombob had in Mario Party Advance. In Super Smash Bros. for Wii U, while Galoombas do not appear directly in the game, they are mentioned in one of the randomly generated Tips. In it, it is clarified that Super Mario World has no Goombas, and that Galoombas are a different species. In Wario Land 3, the Chestnut enemies that Wolfenboss summons look very similar to Galoombas, and are similarly knocked around when hit with the Dash Attack. ↑ Nintendo. (February 13, 2019). Super Mario Maker 2 – Announcement Trailer – Nintendo Switch. YouTube. Retrieved on February 13, 2019. This page was last edited on April 6, 2019, at 00:41.